A couple of weeks ago I blogged about the billboard for the Fourteen11 student show. I just saw another ad for an art exhibit in an unexpected place--on Facebook. 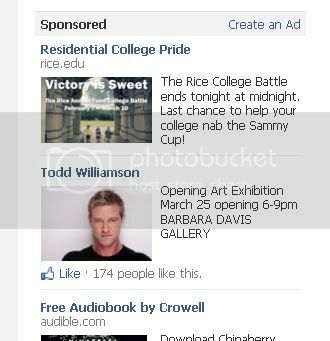 When you click on the add, it doesn't take you to Barbara Davis Gallery, it takes you to Todd Williamson's Facebook Page. A quick check at the Barbara Davis Gallery website doesn't say anything about this show (more than a month away), but Williamson was part of the group show that just ended there. What is interesting here is that in both the Fourteen11 billboard and the Todd Williamson Facebook ad, it was the artists and not the galleries who took out the ad. Artists may not like the idea of self-promotion like this, but I suspect it's going to be a permanent part of the world of art from now on. The issue is how to keep from seeming totally crass (unless crassness is part of your artistic identity, like Mark Kostabi). It's all part of personal brand management, which is an irksome concept but one we all participate in every time we update the old resume or join Linkedin. Ha--you aren't the only one to comment on his looks. His art (from what I can determine from looking at his website) doesn't thrill me, but I wrote this post neither to condemn or condone his work. Rather, I am always interested in how art (and artists and galleries and institutions) situate themselves in the world--and that includes how they promote themselves.